In Tim Burton's classic comedy "Beetlejuice", the toxic title character can escape from his inferno only if someone pronounces his name three times in a row. 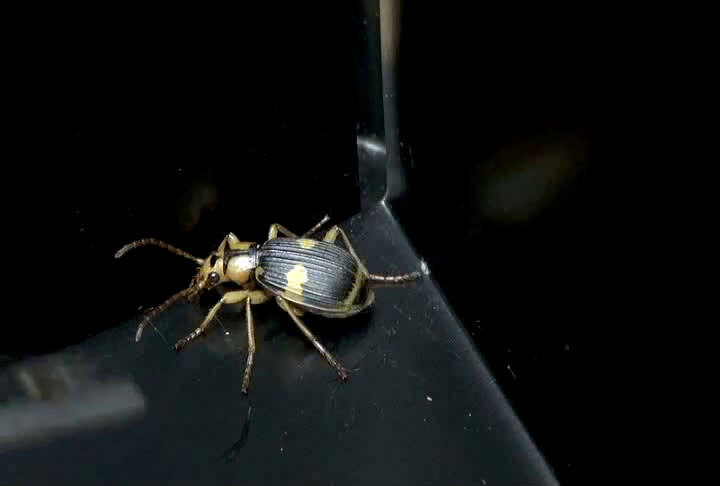 The real-world bombardier beetle escapes from its purgatory—the belly of a predator—by squirting the real thing: boiling-hot pulses of noxious beetle juice, forcing an attacker to vomit up its would-be prey, researchers reported Wednesday. The beetles just shake it off and walk away, according to experiments conducted in Japan and chronicled in the British Royal Society journal Biology Letters. "All 16 beetles that the toads vomited up were still alive and active," lead researcher Shinji Sugiura, a professor at Kobe University, told AFP. "Fifteen of those beetles survived for at least two weeks," with one living more than 18 months—probably longer than that toad that tried to eat it, he said by email. More than 600 species of the bombardier beetle famously marry chemical warfare with pinpoint firepower to ward off their enemies. The carnivorous insect stores two chemical compounds—hydroquinone and hydrogen peroxide—in a pair of reservoirs tucked inside its abdomen. When startled or threatened, the beetle triggers a chemical reaction that results in jet streams of vapour—often delivered in powerful pulses—toxic enough to kill an attacking insect. And if that doesn't do it, the temperature might: the liquid is typically about 100 degrees Celsius (212 degrees Fahrenheit), the boiling point for water. While the bombardier's methods are notorious, it was not known how well they worked against much larger toads that swallow their victims whole in the blink of an eye. To find out, Sugiura and colleague Takuya Sato collected predators and prey from forests in central Japan and took them to the lab. 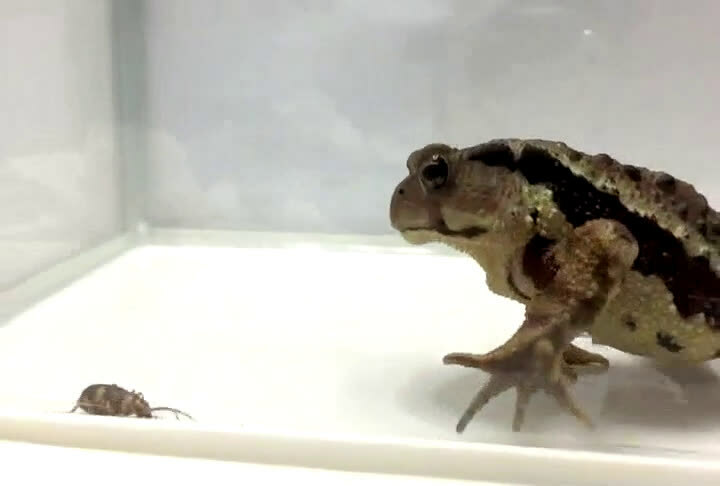 In one corner—weighing in at about 110 to 150 grammes, respectively—were specimens from two species of toad, Bufo torrenticola and Bufo japonicus. In the other corner, at a measly 0.2 grammes, was the beetle Pheropsophus jessoensis, along with several other bombardier species of about the same size. Given the opportunity, all the toads gobbled up the beetles in a now-you-see-it, now-you-don't flash. 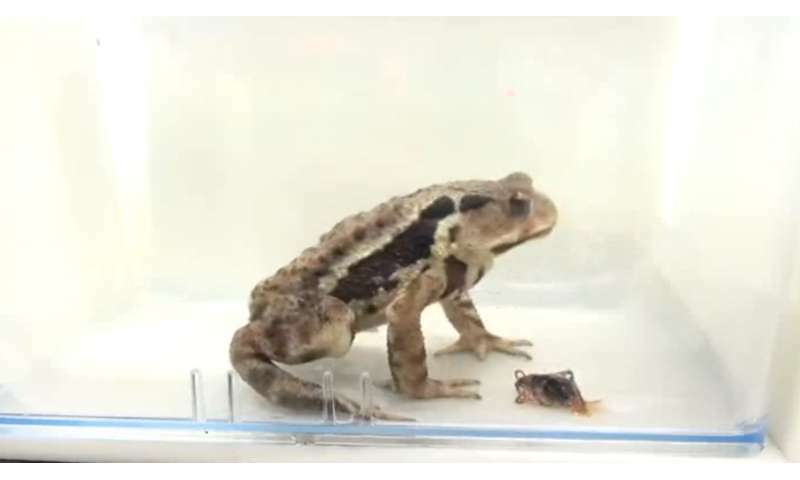 "An explosion was audible inside each toad, which indicated that P. jessoensis ejected chemical spray after being swallowed," the study reported. About 35 percent of the beetles devoured by B. japonicus managed to escape, in as little as 12 minutes in one case, and after 94 minutes in another. The success rate for the beetles was nearly twice as high when gulped by B. torrenticola, though the toads did not vomit them out any faster. Interestingly, these toads did not share a habitat with the beetles, suggesting they had not—through the process of evolution—built up a tolerance to the insects' chemical shower. The toads, in all cases, were unscathed.